Wooden pallets have become unavoidable in several businesses, and are an essential element in regards to the storage and transport of goods. Though they are very much in demand and widely accepted, there are numerous myths linked to it and the roles it plays. This is totally false! Trees aren’t just cut down to make pallets only. In fact, pallets are made from a by-product of timber which is used to make the houses and furniture in the building. Lumber that isn’t considered for these functions will be utilized for the making of wooden pallets. 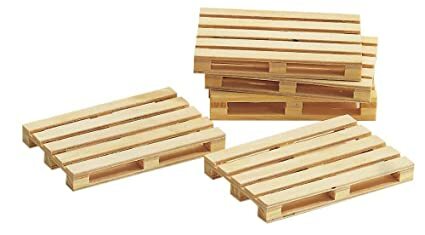 Another common myth concerning wooden pallets is that they’re destined for a single purpose only, be it for storing or transportation of products. Contrary to this belief, wooden pallets are still useful even after its original use. Pallet may also be easily restored by using the pieces of old wooden box or pallets. People usually consider timber as being among the most harmful components for the environment. There are different kinds of pallets available, for instance, plastic and metal; however, wooden pallets are stated to be the most eco-friendly among all. This isn’t correct. Wooden pallets are indeed repairable, recyclable and reusable too. According to a survey, 75 percent of wooden pallets are recycled. In actuality, wooden pallets are the most recycled product in the United States. Wooden pallets have a significantly long lifecycle. As stated earlier, they may be repaired over and over again. Even After the lifecycle of a pallet is complete, they are generally dismantled or are Used to repair different pallets or to manufacture a pallet using recycled components.